The Chargers have had trouble selling out games and President Dean Spanos’ decision to retain general manager A.J. Smith and coach Norv Turner might create more apathy with the fan base according to Tim Sullivan of the San Diego Union-Tribune. 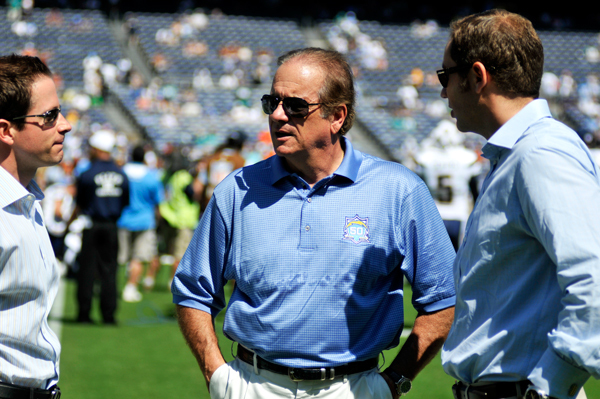 Spanos’ decision provoked sharp criticism and, in some quarters, mild shock. Various commentators charged Spanos with a shortage of courage, a surplus of complacency, a commitment to mediocrity and a fear of his own shadow. Yet in light of the loud dissent and the potential backlash, Spanos’ stubborn stance may have been as audacious a move as he’s ever made.